Yesterday I finished the last item in a whole new outfit and I’m so pleased with how it turned out. 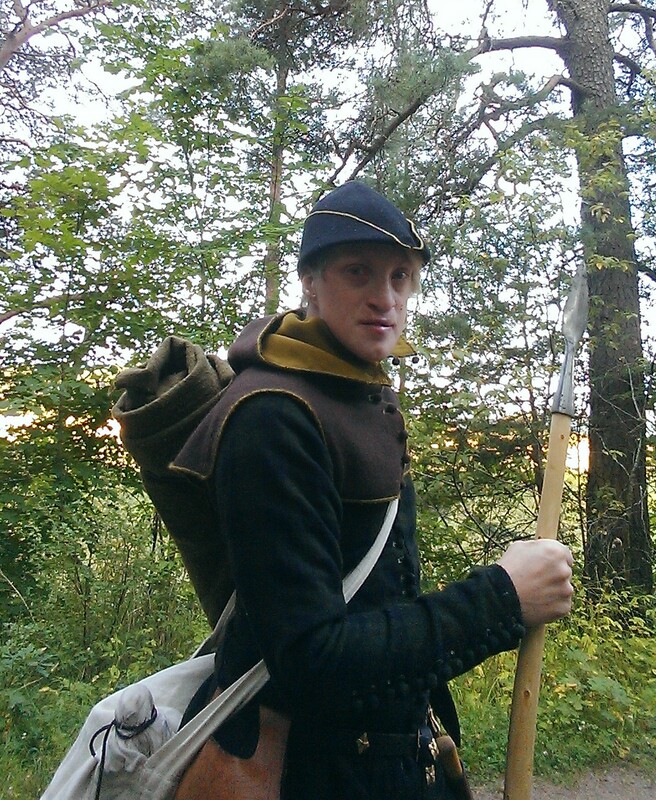 My new kit consists of hoses, a tightly buttoned blue kirtle, a dashing hood and a hunters horn. All of it will come to good use this weekend when Johan and I have new kinds of awesome planned. I will tell you all about my new outfit in devious detail, every piece of it, but I’ll start from the top and from the beginning. My new kit began with my love for the look of this hood. 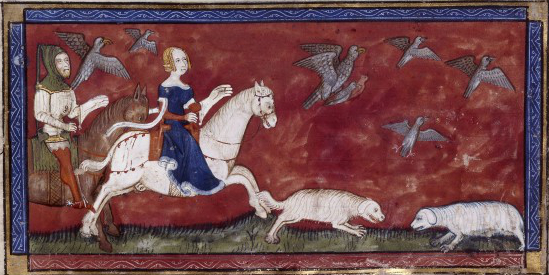 All the illustrations for today’s post are from one of the first copies of one particular manuscript (ca 1370), “Les livres du roi Modus et de la reine Ratio”, meaning roughly “The book of the hunt according to King Experience and Queen Theory”. 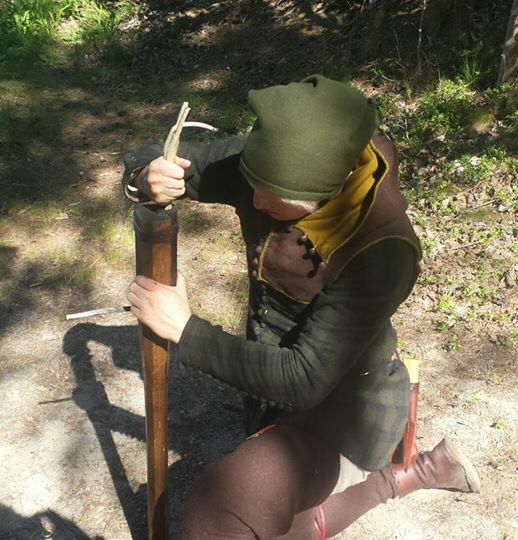 It is my favourite among the medieval hunting books I’ve studied so far and that is why I turned to it for inspiration when I needed a new outfit for our upcoming event, The Feast of St Eustace. The gathering of the hunters, just like we will do for the Feast of St Eustace. The hoods in King Modus are very small and buttoned down the front. The cut of the “collar”-part is usually is more square than round-ish and it has crescent-shaped take outs for the shoulders. That means that the hood leaves parts of the shoulder bare. This arrangement locks the hood in place while it also allows for freedom of movement for the wearer. If riding fast while hunting, I’d not like to have my hoods collar be flapping about up in my face. Because of the narrow cut, these sporty hoods are not so easily caught by the wind. And they sometimes even have small straps under the arms, to secure it further which also makes it possible to wear the hood opened and unbuttoned. One picture that especially caught my eye features a riding man wearing a brown hood with some kind of edging in a contrasting colour. I have a thing for details, such as extra well worked edges. I immediately decided that I needed to make one exactly like it. Brown buttoned hood with edges in a contrasting colour. 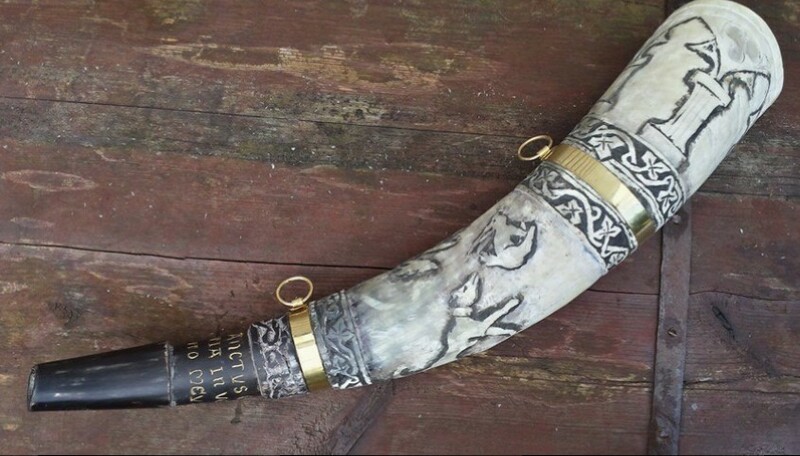 There is something about the design that appeals to me. The extra tight fit, the straps and the neat cut over the shoulders helps to keep the hood in place when hunting, running or carrying stuff over your shoulder. I interpret it as something very much like medieval sportswear and I love the idea of it. It didn’t take me long to make one for myself and soon found that it works extremely well in action. Among other things I’ve tried running and jumping, throwing spears, building barricades, loading and firing a handgun. You can do basicly anything without being disturbed by a hood turning round your neck, trying to choke you. 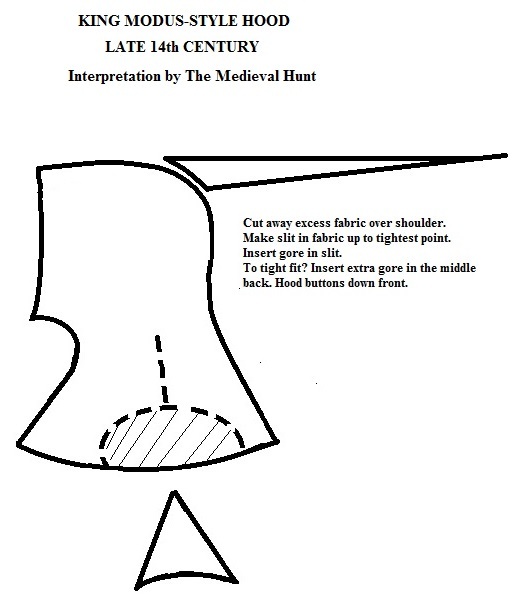 I cannot claim it to be a hunters hood exclusively, it does appear in other contexts and other manuscripts as well. 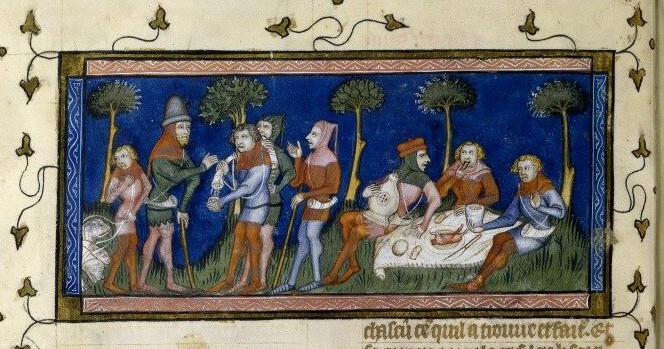 But I think it fair to call it a King Modus hood, since it is so commonly seen in this manuscript. To make it I used the mock-up pattern of another hood I’ve made before, but I made it much smaller and tighter. I also cut away crescent-shaped bits for my shoulders to fit in and added the optional straps. Tablet weaving the edge that joins the outer fabric with the lining. After fitting everything properly together and making sure the lining wasn’t bulging or creasing anywhere, I backstitched it all together with waxed linnen thread by hand, the way I usually do things. 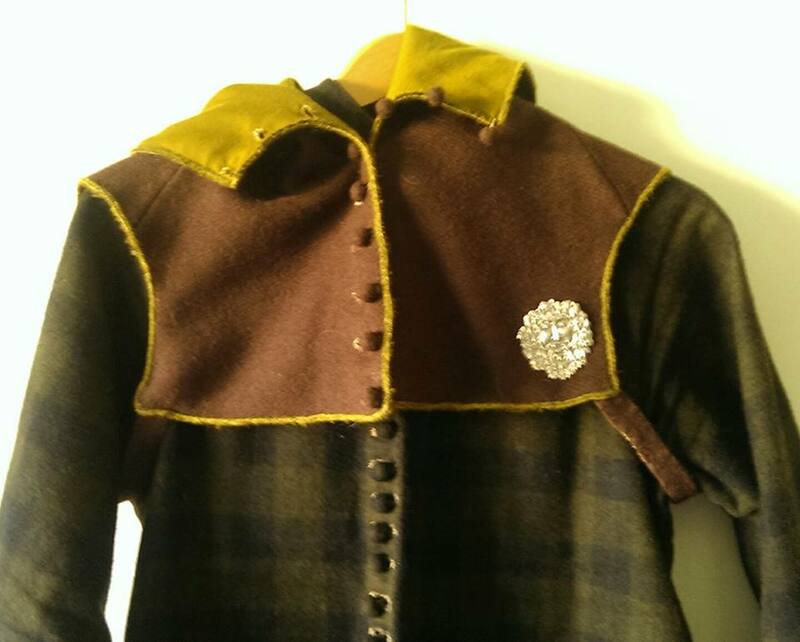 Buttons are made by leftover cloth and I did not put them closer together than strictly necessary, as I want the hood to be real fast to put on. I used a period method for lining that is as beautiful as it is simple. You only get a glimpse of it here where the seam allowance of the outer fabric is folded over the lining. 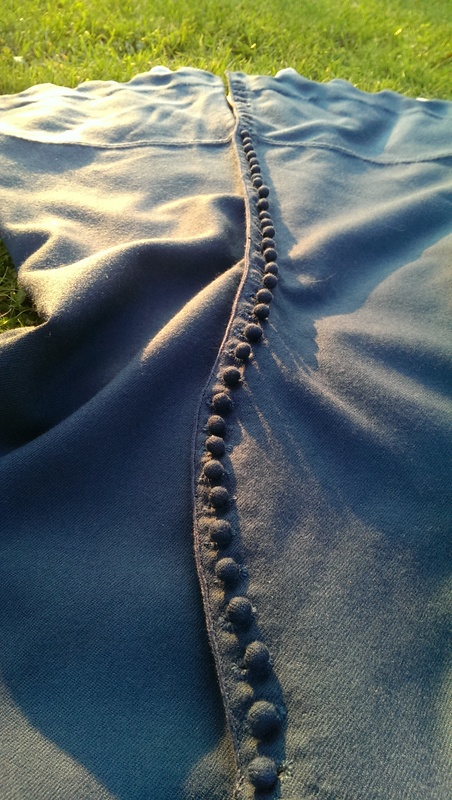 Then it is sewn down over filler threads to make the seam more durable. 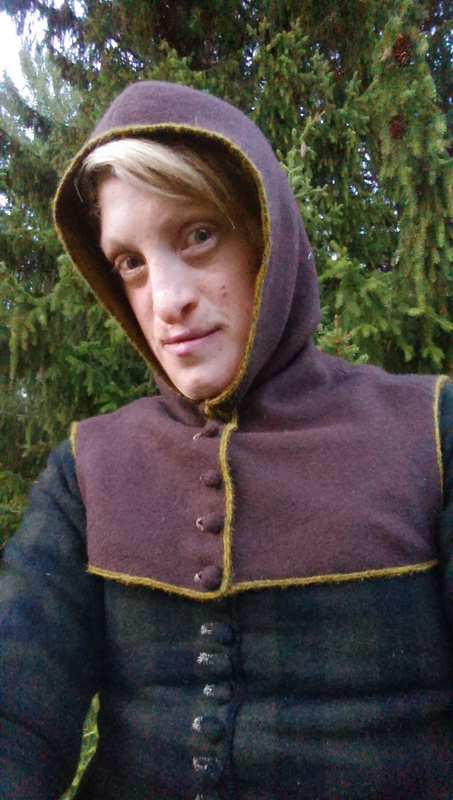 Lastly I finished off the edges all around the hood with a tablet woven edge, just like some of the hoods from Herjolfsnes are done. It means in this case that the outer fabric and the lining of the hood is joined with a woven edge. 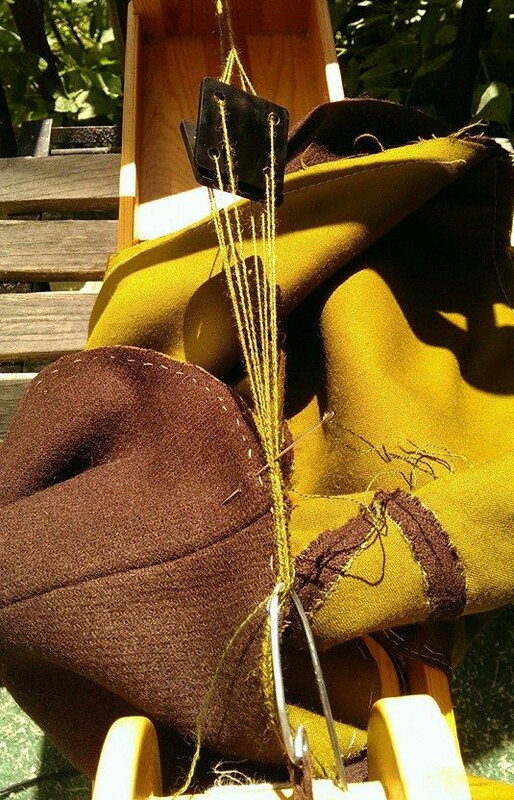 It is sewn on to the hood while weaving, with weft for sewing thread. My friend Bertus Brokamp made a hood like this some years ago and recently wrote about it here. Check it out for further references, he has done some genuine research! But what about the rest of my new outfit? 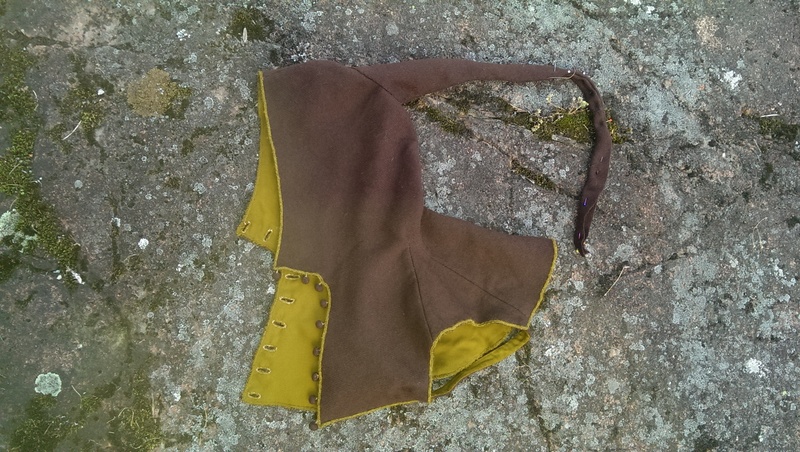 Once I’d gotten as far as finishing a King Modus-style hood in the same fabric as my hoses I had to change my target picture. 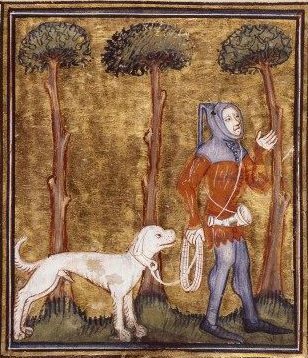 I realised that for several reasons, this picture of a hunter on foot with a horn over his shoulder and a dog in leash suits me and my reenacting much better. And the brown hood and hoses are still game! I only needed a buttoned blue kirtle and a horn. I had all the fabric I needed. So, there I was, contemplating a thin woad blue twill that had been warming space in my fabric storage for years. I had just started to cut out the pieces for my new kirtle when Maria came out and challenged me and the rest of internet to take on “The Manuscript Challenge”. 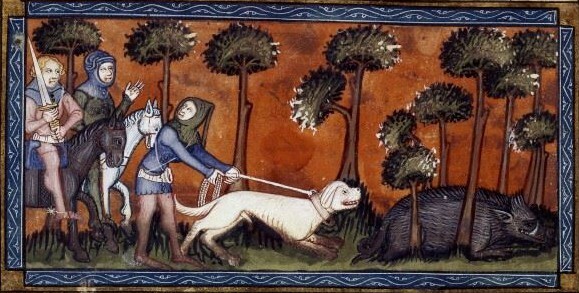 Choose one picture from a medieval manuscript, and choose wisely. Publish your picture, stating that you take on the challenge and describe the outfit. Create your outfit according to the wearer’s outfit, as shown in the picture. Let others in on your progress! Upload pictures of how you proceed, blog about it! Ask for help, tips and advice if you feel the need and wish to do so. Use whatever materials or techniques you wish. The idea is to recreate a visual copy of your chosen image. You have one year to finish. If you’ve followed me so far, you’ll see how well the project suits me and how close I was to finish already when I picked up the challenge. I sure got a head start! 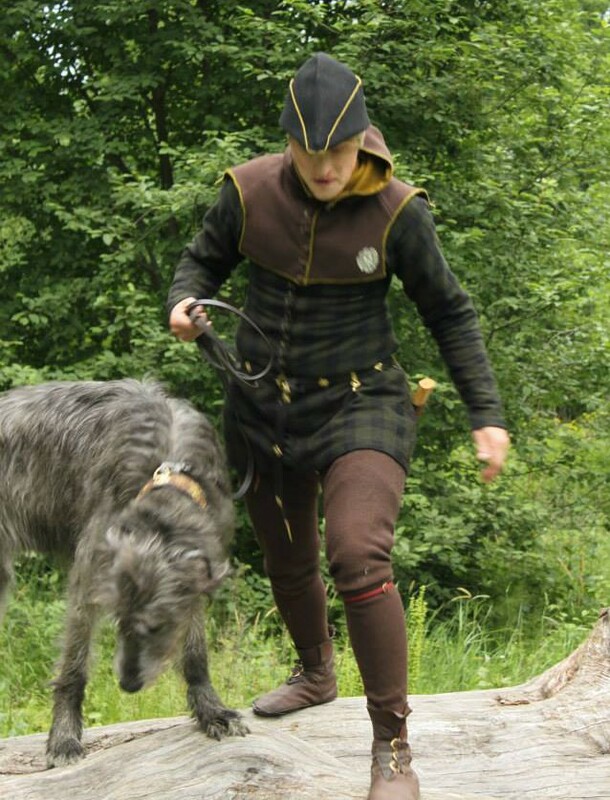 But the glorious goal for me is to re-create not only the clothes but also the picture I used for inspiration, the one with the dog. I’m not properly done until that picture with me as doghandler is published here. The gear is done. I only need a large white dog of the right type and a cooperative photographer. I hope to be able to make the photo shoot happen sometime this week.